1035: Next Cde Davis Marapira, Lands, Agric and Rural Resettlement. 1010: Sports, Arts and Recreation Minister Kazembe Kazembe follows. 1007: Dr Joram Gumbo is next, Transport and Infrastructural Development Minister. 1003: Presidential Affairs Minister Cde Simbarashe Mumbengegwi is next to sign his oath of office. 0959: Cde Oppah Muchinguri-Kashiri is next peen her signature on assumption of duty papers. 0954: Ministers now taking the oath of office before the President. 0953: President Mnangagwa reads the citation for cabinet ministers to take the oath of office. 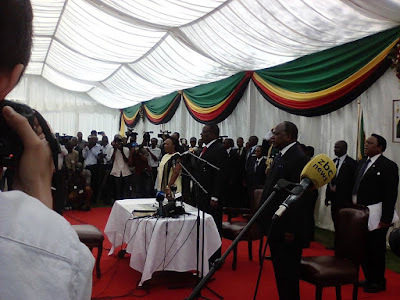 0950: President Emmerson Dambudzo Mnangagwa has arrived for swearing-in of ministers. 0948: Cde Supa Mandiwanzira was reappointed Information Communication Technology Minister but with Cybersecurity added to the portfolio while Cde July Moyo was appointed the Local Government, Public Works and National Housing Minister. 0946: Dr Joram Gumbo retained the Transport and Infrastructural Development Ministry while a technocrat, Mr Winston Chitando comes in as Mines and Mining Development Minister and Cde Oppah Muchinguri-Kashiri as the Environment, Water and Climate Minister. 0942: Dr Obert Mpofu was appointed Home Affairs and Culture Minister while Air Marshall Perrance Shiri comes in as Lands, Agriculture and Rural Resettlement Minister. Dr David Parirenyatwa was reappointed to the Health and Child Care Ministry. 0938: President Mnangagwa appointed Cde Patrick Chinamasa to the Finance and Economic Development Ministry. He has been in an acting capacity in that portfolio since November 27. 0929: First to take the oath of office will be cabinet ministers, followed by Dr Christopher Mushohwe, ministers of state for provincial affairs and then deputy ministers. 0919: All is set for the swearing-in of Ministers following their appointment by President Emmerson Mnangagwa to serve in various portfolios as cabinet ministers and ministers of state respectively.